Wedding PR: Brides.com, AllSeated, Timeline Genius and more! Happy Monday everyone! The start of the week means we’ve got another fabulous set of client features, from Brides.com to AllSeated, Timeline Genius and more! See blow for more. 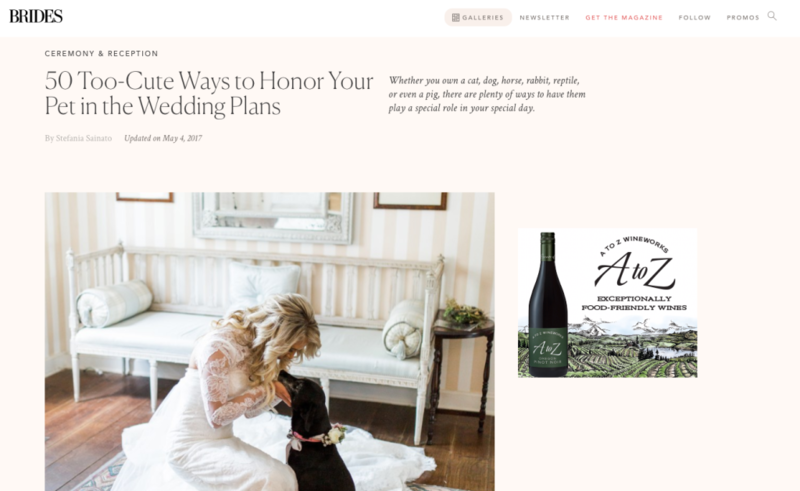 Elly’s Photography, Jenny DeMarco Photography, and Kaysha Weiner Photographer were featured in the Brides.com article, 50 Too-Cute Ways to Honor Your Pet in the Wedding Plans. See the full article here. OFD Consulting was featured on WeddingWire EDU with her guest article, Easy Peasy PR Tips for Small Business Pros. See the full article here. 100 Candles was featured on Top Wedding Questions with their guest article, 4 Surefire Ways to Blow Away Your Guests with Candles. See the full feature here. Destination Weddings Travel Group was featured on Destination I Do in the article, Advice for a Hawaii Wedding Away!. See the full feature here. Jacqueline Events & Design and International Academy of Wedding and Event Planning were featured in the Brides.com article, Wedding Planners Reveal Their Wildest Wedding Moments. See the full article here. Destination Weddings Travel Group was featured on AllSeated with their guest article, Destination Wedding Cuisine Trends. See the full article here. 100 Candles was featured on Timeline Genius with their guest article, Tips for Attracting Millennials Through Your Website. See the full article here. OFD Consulting was featured on Catersource with her guest article, Prepping for a Podcast Interview. See the full article here. 100 Candles was featured on Favor Ideas with their guest article, Top Ideas for Wedding Party Gifts. See the full article here.